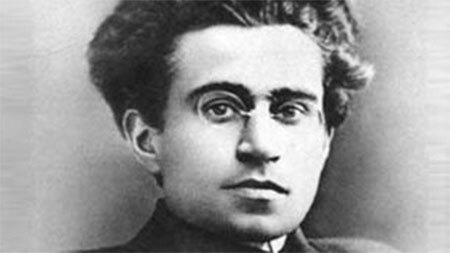 In a polemic against the syndicalists, Antonio Gramsci argued that the syndicalists were wrong in maintaining that unions were capable of being organs of workers' revolution. He said this confused a marketing organization of labor within capitalism -- the trade unions -- with an organization for running production in a socialized economy -- the workers councils. Because the function of a union is to affect the terms and conditions of the sale of labor to the employers, he argued, it is an organization specific to a capitalist society. However, if we look at the actual functions of the Turin shop councils, as described in the Shop Stewards' Program, we find that much of their actual function is the organization of the struggle with the employers over the "terms and conditions" of labor within capitalism. For example, the shop stewards were called upon to "exercize surveillance" over the enforcement of the existing labor contracts and "resolve disputes that may arise between the workforce and management." In other words, the shop stewards movement was inevitably a shopfloor unionist force precisely because it expressed the desire of the workforce for a more effective organization in the struggles within the current capitalist system as well as expressing their aspirations for complete control. Since any mass workers movement of this sort arises initially within the capitalist system, this "dual" function seems inevitable. Moreover, Gramsci's real argument against the possibility of "revolutionary unionism" was based on the institutionalized, bureaucratic character of the official CGL trade unions. And, by the same token, his argument for the revolutionary potential of the shop councils, was not their complete non-involvement in present-day unionist struggles, but, rather, their independent, non-hierarchical character. "[As it develops,] the union concentrates and generalizes its scope so that the power and discipline of the movement are focused in a central office. This office detaches itself from the masses it regiments, removing itself from the fickle eddy of moods and currents that are typical of the great tumultuous masses. The union thus acquires the ability to sign agreements and take on responsibilities, obliging the entrepreneur to accept a certain legality in his relations with the workers. This legality is conditional on the trust the entrepreneur has in the solvency of the union and its ability to ensure that the working masses respect their contractual obligations." But it is precisely this bureaucratic structure of institutionalized trade unionism that makes it impossible for it to be an instrument of revolution, since these structures exist to "perpetuate and universalize" the "industrial legality" developed in the accumulated compromises with the employers. The union "represents legality, and must aim to make it respected by its members." "The factory council is the negation of industrial legality. It tends at every moment to destroy it....By its revolutionary spontaneity, the factory council tends to unleash the class war at any moment; by its bureaucratic form, the trade union tends to prevent the class war ever being unleashed." But once we understand what Gramsci means by "union" -- that is, institutionalized, bureaucratized trade unions -- then we can see that anarcho-syndicalists would agree with Gramsci's views on the limits of trade unions since they agree that the bureaucratized trade unions tend to constrain workers action within the limits of what is acceptable to the employing class. Such top-down structures are, thus, not capable of being organs of revolution. However, anarcho-syndicalists would point out that when they advocate "revolutionary unionism," they are using the term "union" in a different sense. There is another sense of the term "union," referring to association of the workers themselves in opposition to the employers: the workers "in union" with each other. And, in this sense, the shop council movement was also a form of unionism. Moreover, Gramsci sometimes uses the word "union" in this other sense, as when he says that the Turin shop council movement is a form of "industrial unionism," uniting the workforce across divisions of craft and ideology. Moreover, if it is the non-bureaucratic, mass autonomous character of the Turin shop councils that gives them a revolutionary potential, as Gramsci had argued, then USI activists could argue that Gramsci must concede that the "unions" advocated by the anarcho-syndicalists have a revolutionary potential also since they have the same character and structure as the Turin shop councils. One lesson of the Italian revolution of 1919-20 is that the supposed opposition between "councilism" and "syndicalism" is more myth than reality. The main body of Italian syndicalism -- the USI -- adopted the methods and organizational forms of the Turin shop council movement. At the same time, the anarcho-syndicalists in Turin were slow to build an USI organization there because the independent, democratic organization of the Turin councils and their orientation to direct action and workers control made them a living approximation of anarcho-syndicalist ideals. This article originally appeared in Ideas & Action #11 - Summer 1989. There's another sense of the term "union," referring to association of the workers themselves in opposition to the employers: the workers "in union" with each other. Gramsci sometimes uses the word "union" in this sense, as when he says that the Turin councils are a form of "industrial unionism". Good article. If Gramsci's criticism is that institutionalised and bureaucratic trade unions - because of their hierarchical centralism - "prevent the class war ever being unleashed", then couldn’t that be equally applied to say the Marxist proto-party or any other organisations that maintains hierarchical centralism at the expense of worker control. If the attempted reformism and the formalisation of trade unions - an effective of agreements with capitalists - stifle revolution, then don’t also parties which fight elections or those who attempt to capture the state (a formalised structure which Gramsci's criticism would accordingly argue disenfranchises workers more than most). Hello. So I'm doing an assignment on the Spanish Civil War for school and I'm using one of his articles uploaded on this site. Who is Tom Wetzel exactly? I can't find anything about him and would like to his biases and education and whatnot before turning in the most important project of this semester. Thank you.